Feeling hot? Chill yourself with this “Cool Drink”….piping hot Moong Dal Rasam! Ideal Soup for summer. Hailed as the healthiest among dals, these small, split, flat, yellow coloured beans used in the rasam are quick to cook, easy to digest, low in calories, high in fibre, rich in nutrients, packed with protein and helps shed weight. This “Friend for All” cooked moong dal makes a healthy friend with people very young and old, as also the sick and ailing. Wash moong dal with water, drain and keep aside. Wash tomato, ginger, curry leaves and coriander leaves in salt water. Drain and keep aside. Cook dal in a pressure cooker in low flame along with water, turmeric powder and a dash of ghee. When the dal is half cooked, add chopped tomato pieces and continue cooking the dal. Switch off the burner after 2 whistles. Let the pressure in the cooker subside. While dal is getting cooked….you can do grinding. For this, chop ginger after peeling its skin. Grind all ingredients listed under “For grinding” using a few spoonfuls of water. Add this ground chutney, water and salt to the cooked dal and boil it for 5 to 10 min. on low flame. Watch the gentle green coloured rasam glowing while boiling with the jeera-ginger-pepper combine for 5 to 10 min. Towards the end add lime juice and switch off the burner. 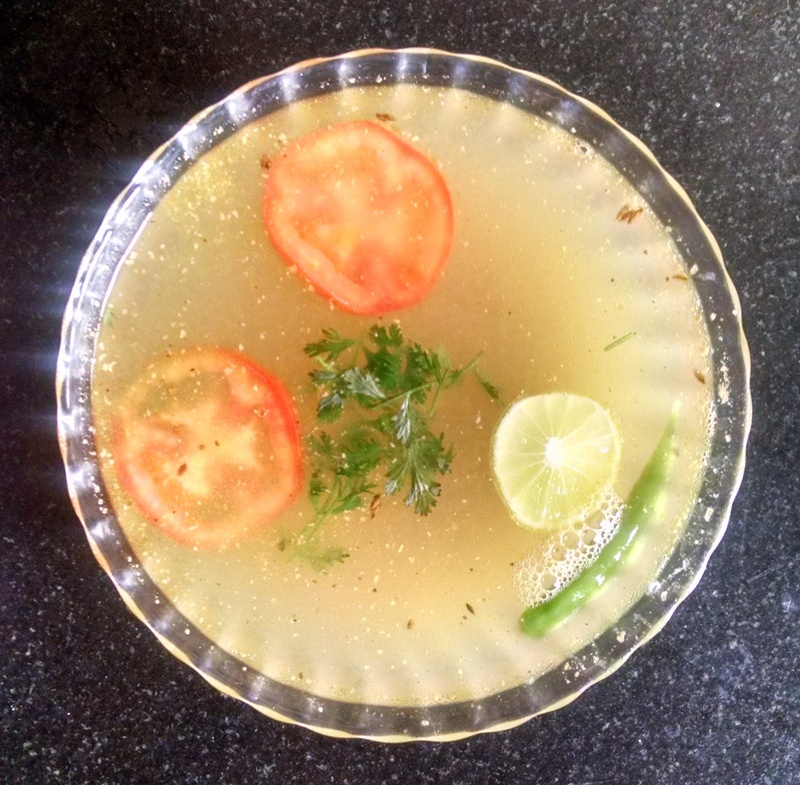 The awesome aroma from this nutritious rasam rings a bell… it’s time for seasoning. Heat ghee in a small skillet. Put cumin seeds. When they crackle put pepper corns and slit green chilly. Switch off the flame. Immediately pour it on to the boiling rasam. Garnish it with thoroughly washed and chopped fresh coriander leaves. Moong Dal Rasam is now ready. Serve hot with steamed rice, idli or use it as Bonda Soup, a popular combo of South India. Quantity of water, salt and spices can be altered to suit the consistency and taste that you desire. Moong dal is used for preparing a variety of dishes like rasam, dal, pongal (khichdi), curry, vada, payasam (kheer), besan laadu, halwa, kosambari (salad), soups, spicy parathas and even in many rice preparations. While purchasing moong dal, make sure it is yellow in colour and free of moisture or insects. This can be known by checking for lumps, if any. Moong dal can be stored at room temperature in air tight container for a few months.